Anyone start fishing the hard water yet? I am going to try and get on the ice here today. There should be at least 4 inches of ice today. 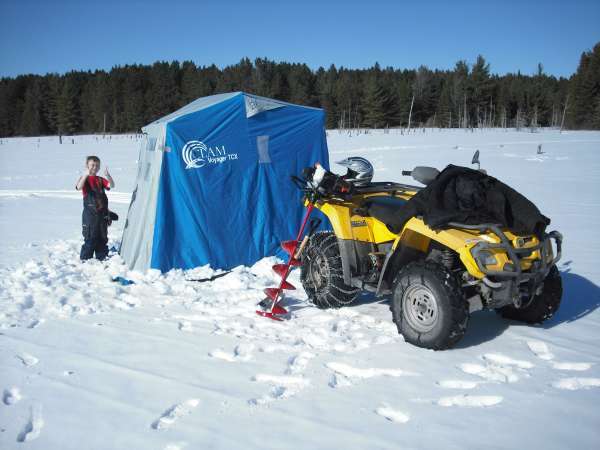 Do you have an Ice fishing shack? 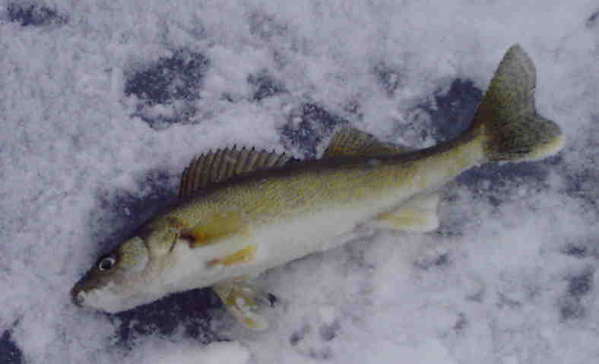 Never been ice fishing, sounds like a long day with a cold bottom...and I'm not talking about the lake bottom either. Just out of curiosity...what kind of safety gear do you take? I don't suppose you wear neoprene scuba suits but, I don't imagine there would be much help if you went through with a bunch of cotton layers on. Never really thought about it, which is why I ask. Get us some pictures, Gary! Alec - Woodworking rookie, and Private in the United States Army. Oh yeah! In Minnesota, folks are setting up all over the lakes and streams. Not quite enough ice for vehicles yet, but the fishing is good. Here is a webcam on a MN lake. Almost sun setting time, so maybe tomorrow it will be more active. The only place I've ever "ice fished" was in Alaska. Ice 4 feet thick gives a very secure feeling. Fished for Cocanie (spelling)(land-locked) Salmon and Rainbow Trout. Used to use the ole Int. Scout to plow up a snow berm to fish behind. Really helped to cut the wind. 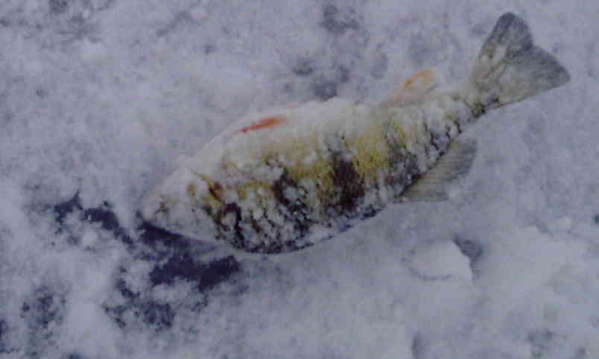 They are ice fishing here on the inland lakes, the big lake and its bays aren't frozen yet. Though they are starting to have lots of "ice cubes" floating in them... Won't be long. I went out on to Pymatuning Lake. During WW2 this lake was used to test torpedos. I was walking on 5 1/2 inches of ice above 18 feet of water . I have a shanty but I don't use it much. Here a shanty must be removed everyday when your done fishing. I was a little over a quarter mile from shore. I missed a few fish and managed to catch two small ones. I didn't take any pictures of the lake today but I will the next time. I could have kept the perch but I threw it back. The walleye needed to be 15 inches to be legal so it went back to grow bigger. Yea, me too. I used to put my back to the wind and huddle over a hole and think it was the greatest place to be in the world. Now I have a finger that feels like its been hit with a hammer if it gets below 40 degrees. My idea of a perfect ice fishing trip this winter I think would be to go over to Burlkraft's, go out to the bar to eat Bluegills and talk about how much fun it used to be to go ice fishing. Doesnt get cold enough here but I am interested. Post more pics and tell how it is done, what kind of fish, lures, temps, etc. It sounds fun. The only thing we do on the ice here is slide in the ditch. This was last winter on Cornwall Flooding east of town. We were using waxworms for bluegills that day. Greg, you are going to have to teach Zack how to tell fish stories, his hands are too close together. Here are some pictures for you warm weather friends. A couple of guys fishing without a shanty. This is how I normally do it. 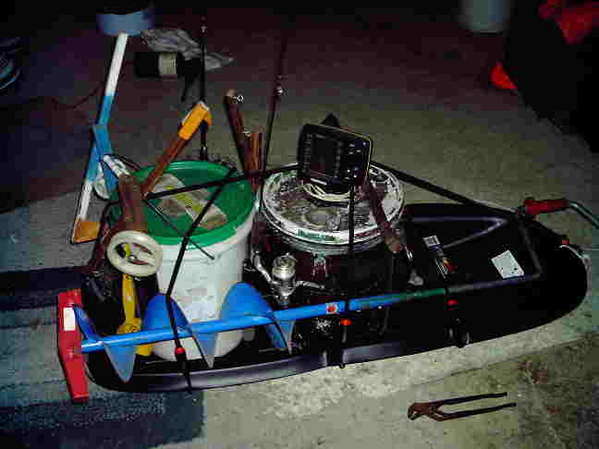 My shanty and ice auger. The auger is used to drill the holes to fish in. I will put some on here once I upload them. We have been out for the last two weeks here. 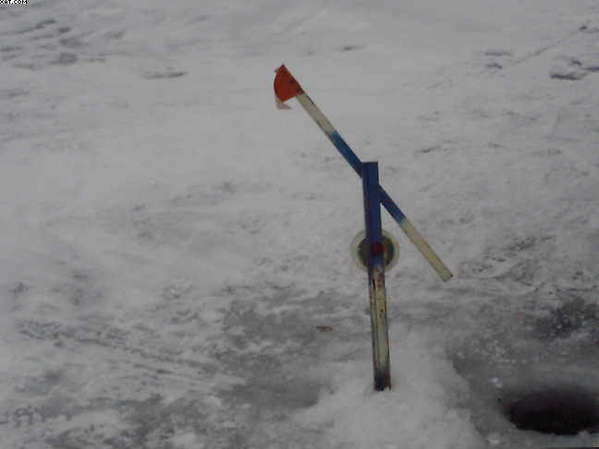 On a small inland lake with 6" ice. Catching 9 or 10 bluegills the last hour or two before dark most days. Corley the gills bite best in the morning and evening. We use ultralight rods with spring bobbers and waxworms for bait. Nice pictures Gary and Corley. My idea of a perfect ice fishing trip this winter I think would be to go over to Burlkraft's, go out to the bar to eat Bluegills and talk about how much fun it used to be to go ice fishing. You just need to dress for the cold. This is a tip up. It is a type of drop line. 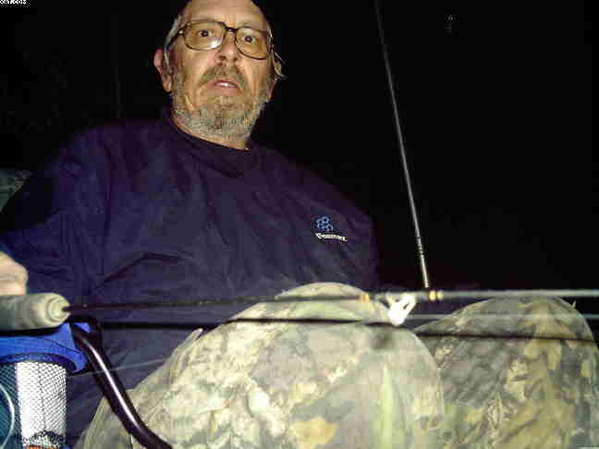 This picture shows it waiting for a bite. This is how it would look if a fish was on it. That surely changes the "I wanta go fish over there" attitude. I've enjoyed seeing something that is completely different for me.